Keep this Southwest pork chop recipe in mind for a hearty 30-minute dinner. 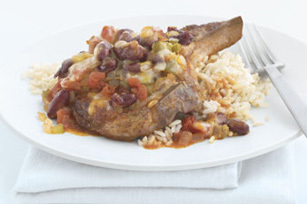 Southwest Pork Chops and Rice features rice, beans and diced tomatoes. Cook peppers and onions in large nonstick skillet on medium-high heat 5 min. or until crisp-tender, stirring frequently. Meanwhile, rub both sides of chops with combined seasonings. Add chops to skillet; cook 2 to 3 min. on each side or until evenly browned on both sides. Add beans and tomatoes; cover. Cook on medium-low heat 5 min. Top chops with cheese; cook, covered, 2 to 3 min. or until chops are done (145ºF) and cheese is melted. Remove from heat. Let stand 3 min. before serving chops and vegetable mixture over rice.